We think it’s time for placebos. 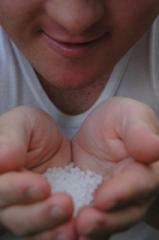 There are a lot of spoof sites about placebos out there. This isn’t one of them! We actually sell placebos. 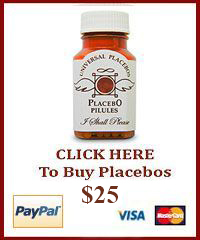 Just click on the Buy Placebos button. But more than that, we hope to offer a wide range of information about the placebo effect, information which will inform, challenge and amuse, and which we will consistently update as we find more and think more about what the placebo effect is and what it means. And, dear reader, as we interact more with you – you can comment on the posts on this site, and you can contact us any time! We make absolutely no therapeutic claims for our placebos – they are made of sugar; they are not drugs – but we offer them, with love and with a sense of fun, as triggers and inspiration for the placebo effect. Finally, thank you for your enthusiastic reception to Universal placebos … for your smiles and encouraging comments . . . Special thanks to our growing list of placebo users for being courageous enough to consciously choose to benefit from the placebo effect.